Female K (Zanzi) hatched in late April on an island in the Flatanger region c125 kilometres north of Trondheim in west central Norway. Zanzi was collected on 19 June from a nest in a Norway Spruce by Torgeir Nygard, Ole Martin Dahle and Allan Mee. Ole Martin had monitored this nest during the breeding season while leading sea eagle safari trips from his base in Lauvsnes. Zanzi was transferred to our holding site in a converted barn in Stjørdal only five minutes from Vaernes airport where it was expertly looked after by Tom Roger Østeras. On 24 June Zanzi weighed 5.15 kilos and was estimated to be 8 weeks old based on her tail length. On 25 June Zanzi was flown from Trondheim to Kerry along with 22 other eaglets and was housed in a large cage in Killarney National Park. On 29 July we attached PVC wing-tags (white on right and black on left) with the letter K and a solar-powered GPS satellite transmitter. The 70g solar PTT-100 from Microwave Telemetry takes GPS fixes every hour during summer daylight hours with the data transmitted to Argos on day 3. The number of hours the transmitter operates is reduced in autumn and winter to save battery power during the shorter days. 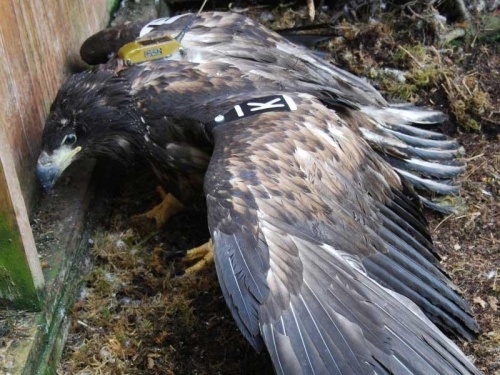 On 9 August Zanzi was released along with nine other eaglets, roosting on her first night on the west shore of Lough Leane. Over the next few days she moved over a short distance along the shore of Lough Leane where she soon found one of the feeding sites provided for the young eagles to help them survive the first 1-2 months after release. Zanzi is named after the Zanzibar Inn, our 'home from home' while based in Lauvsnes, Flatanger! Ole Martin Dahle runs a very successful ecotourism business in Lauvsnes providing superb opportunities for photographers and nature lovers to get exciting views of sea eagles, as well as golden eagles, capercallie and many more bird and mammal species (Norway-nature.com). Ole Matin has been a good friend and contributor to the collection of sea eagles for the Irish reintroduction programme over the last 5 years. We will be watching the movements of Zanzi closely over the next few years so check out our website for the latest satellite data!